Chapter breaks in novels are like the Becher’s Brook jump in National Velvet. That’s where the bodies pile up. Many a book has been declared dead to its reader and cast aside never to be remembered–and all because the reader reached a chapter break and didn’t care enough to keep reading. The good news is that when chapter breaks are done right, many a reader has kept scrabbling through the pages, deep into the night, because he simply couldn’t look away from the enticing hooks the author kept planting at the ending and beginning of each chapter. That’s not enough good news for you? How about this: Any writer can learn to write amazing, can’t-look-away chapter breaks. Why? Because the necessary techniques are all completely learnable and completely practical. Welcome to the fourth installment in our month-long series featuring important writing techniques I used or had reinforced for me while writing my soon-to-be-released historical dieselpunk novel Storming (coming December 4th). I bet I’ve gotten this question half a dozen times this year alone. Lots of writers want to know exactly what constitutes a chapter. What are the guidelines? Is there an optimum word count to shoot for? How many scenes should be included? The short answer is that there really aren’t any guidelines for what makes up a chapter. Shorter chapters equal a faster pace; longer chapters equal a more leisurely pace (and also sometimes a more daunting challenge in convincing readers to read on). Suspense and YA books often get shorter chapters (James Patterson routinely uses chapters of a single page), while other genres tend to use more standard-sized chapters. This is the length readers generally expect from chapters. Between 4-5,000 is pretty average for me. Although not absolutely necessary, it’s usually a good idea to try to keep all your chapters around the same length. This allows readers to fall into the rhythm of your story and helps them know what to expect whenever they begin a new chapter. Chapters are an arbitrary division within the story, based on word count and pacing needs. Scenes, on the other hand, are never arbitrary. Scenes are based on a solid and set structure. This structure can be contained in or divided by chapters, but is internally unaffected by the chapter breaks. With those guidelines out of the way, let’s take a look at how to successfully break–and begin–your chapters. 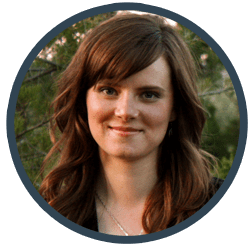 We want to make the chapter breaks an integral part of your story, rather than a stumbling block between your readers and the rest of your book. How to End Your Chapters: Disaster! Here’s the only thing you need to know about chapter endings: they must contain a hook. What? You thought the hook only belonged in the beginning? Not a’tall. There are hooks all over the place in a good story. Every scene should introduce new elements and raise new questions that draw readers deeper and deeper into the web you’re weaving. The story itself should be interesting enough and the reader’s investment deep enough that he’ll keep reading even past muffed chapter breaks. But you can’t take that chance. At a glance, what do you think looks like consistently the most interesting part of the structure? The disaster, right? This is the “big” moment in the scene. This is where the conflict explodes. This is where new questions are raised. And what are questions except hooks, right? This is why I almost always end my chapters with the disaster part of the scene. 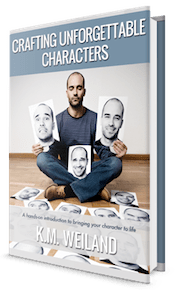 The great thing about this approach is that it allows you to begin your next chapter with the character’s reactions. Don’t be fooled: despite the fact that the reaction part of the scene isn’t focused on action, the sequel is always one of the most intriguing. 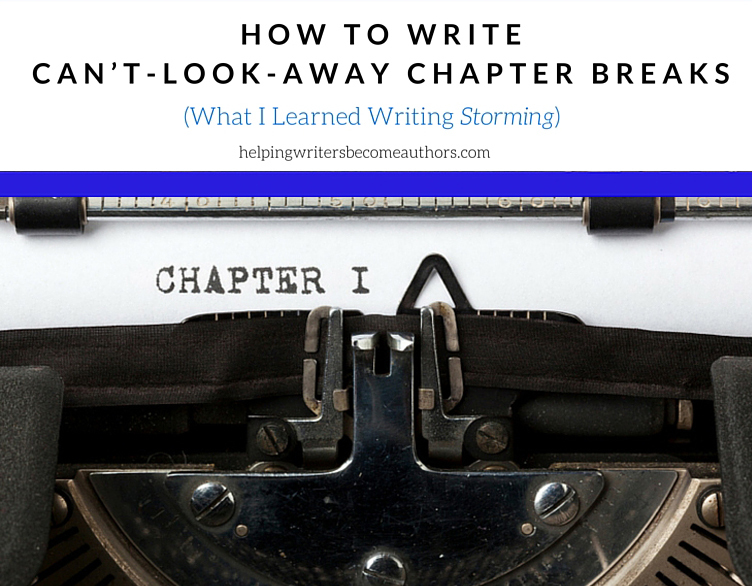 Do it right and readers will eagerly read right through your chapter breaks just to see how your characters react to what just happened in the disaster. Hitch might be dizzy and hurting, but he wasn’t that far out of it. Throwing Jael at Zlo’s mercy and then turning Zlo loose sounded like the worst idea yet. He closed his eyes again and blocked out the murmuring and shouting of the gathering crowd. For just the moment, he let himself wish he and Jael were far away, some place where no one knew where they were—not Griff or Nan or Campbell, and definitely not Zlo. It was a fruitless wish and he knew it. No way he was letting her sacrifice herself, no matter how stubborn she decided to be. But there was also no way, this time, that he could run away—which meant he could hardly take her away either, even if she’d go. When we think of the challenges of chapter breaks, we usually think of chapter endings. But that’s just the half of it. The beginning of the next chapter is every bit as important. How many times, as a reader, have you been hooked by a great chapter ending, only to take a peek at the following chapter’s opening and put the book aside anyway because the new chapter’s opening failed to pull you in? 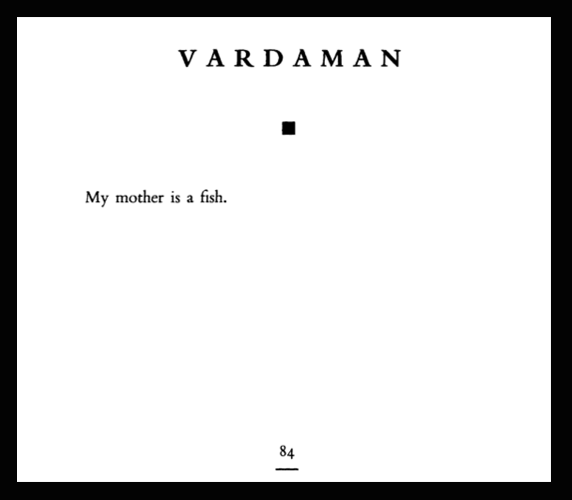 In a lot of ways, chapter openings are even trickier than endings. Like the beginning of the book itself, the beginning of each chapter has a lot of stuff it needs to juggle. It needs to reset the scene, establish the setting and the characters’ whereabouts within it, subtly reference what just happened in the previous chapter, and hook readers right back into the story. In short, a good chapter opener must begin with a hook of its own, just as the previous chapter needed to end with a hook. But even a good hook can’t save your new chapter if you get lost in all that other stuff you have to do in setting the stage. In short: don’t clear your throat. The basic guideline here is simple: Begin your chapter at the last possible moment. Two days passed since last we saw our intrepid hero. He spent those days gathering his resources and healing his wounds. He’d gotten a secret communique through to his commander, letting him know what had happened [insert summary of previous chapter] and what his plans were [insert summary of everything that’s going to happen in this chapter]. Even in the most leisurely of novels, readers don’t ever need to be dragged through that kind of meandering throat-clearing. Really, all that’s happening there is you, the author, trying to get your bearings in this new chapter. Nothing wrong with that. Just make sure you cut those paragraphs once you actually get down to the hook. My favorite trick is to begin the chapter with the action already rolling, then briefly break to set the scene and refer to the previous chapter’s events. Then I just keep right on going. The top of Hitch’s head felt about like a hard-boiled egg someone had smashed in with a spoon. That didn’t do much to make him hungry for the two sunny-side-ups staring at him from his plate. He hunched over the counter at Dan and Rosie’s Cafe on Main Street and cradled his mug of lukewarm coffee. What he needed at the moment was a plan. Any plan. Even a stupid one would do—so long as it didn’t involve Jael finding that consarned pendant and turning herself over to Zlo. He growled. The two above tricks for ending and beginning your chapters are really all you need to know in order to write can’t-look-away chapter breaks. But here’s a little bonus trick my editor CathiLyn Dyck and I worked on in Storming to seamlessly bridge chapters by harmonizing the ending and beginning with subtly connected imagery and symbolism. Cliffhang Hitch’s [chapter] closing into Walter’s [chapter] opening—really, the cliffhanger is just a hook that happens before the next chapter’s opening. A hook can be anything—plot, mood, prose device, character reaction. Here I’d suggest a prose device, because the plot does follow through very nicely and the character of Hitch isn’t going to be in view when we turn the page. The moon is silent, and Walter is silent. The moon hides this mystery of falling, Walter hides the mystery of his silence…. You can create a segue through parallels with just a couple of lines of light sketching. This idea is akin to what is called “match cutting” in movie editing. We see this in scene breaks in which the movie cuts from an image in one scene to a similar image in the next scene, such as in this example from Pirates of the Caribbean: The Curse of the Black Pearl. The options here are endless and should certainly be used with a gentle touch, since this technique can easily become on-the-nose and over-the-top. But it’s a nice little way to help readers subconsciously segue between scenes. Here’s the segue I ended up using between the chapters my editor was talking about above. Walter liked the early mornings, especially in the summer—with the full moon still hovering near the horizon, on its way to setting. It nestled, white as a heifer’s face, against the blinding blue of the morning sky. He craned his head back. Use these three simple and immediately practicable tips to become the master of your chapter breaks. Instead of risking your chapter breaks being a stumbling block between readers and the end of the book, make those breaks work for you in keeping your readers fascinated by your story all the way through. Wordplayers, tell me your opinion! 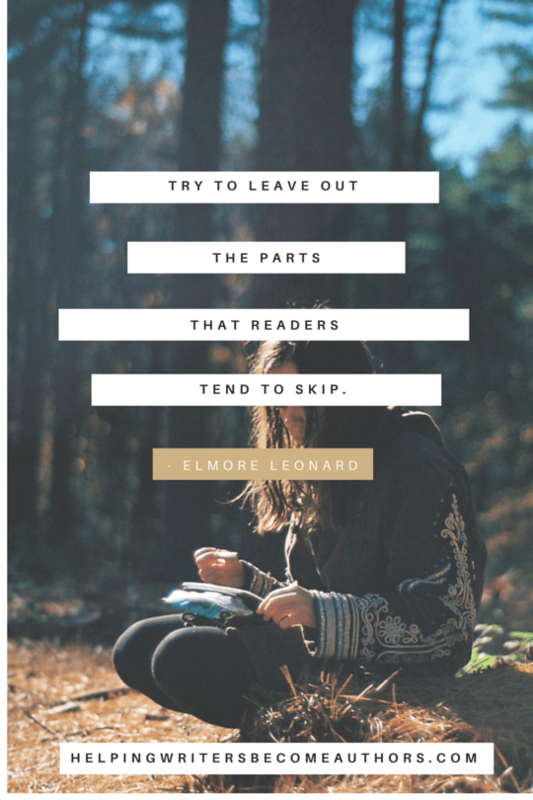 How have you been using your chapter breaks to hook your readers forward? Tell me in the comments! Thanks for the advice about match cutting. I am very cognizant of that in my films and I often have one or two in my scripts. Only makes sense to do it in my novels! Novels are borrowing more and more from screenwriting these days, that’s for sure! That “scene” and “sequel” is very well explained here as well as in Structuring Your Novel. It has really helped me on my story. Thanks a lot! And keep posting! P.S. Look forward to read STORMING. Thanks for stopping by! I’m so glad you’ve found the books useful. Makes my day to hear they were helpful! So helpful, thank you. Moving around chapter breaks is something I’m constantly doing in the editing phase… bookmarking for my next editing round! Scrivener is great for that, since it allows you to move scenes around so much more easily than you can do in Word. Thanks for the great post. The idea of asking a question at the end of every chapter is something that Lee Child does all the time (every chapter, pretty much) in his Jack Reacher books. Re Scrivener – I’m so with you on that. It is a godsend when it comes to structural edits. I haven’t ready any of Child’s books. Does he ask a literal question at chapter endings–or just by implication? 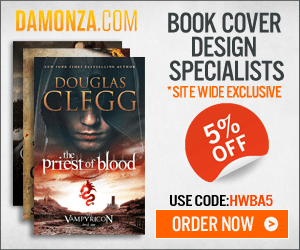 You should – they are real page-turners. He talks about posing a question so that the reader needs to turn the page to find the answer. These are implied questions like “what is going to happen next?”. But his chapters are rarely more than 4 or 5 pages long and it impossible to put the books down! Ah, gotcha. Yes, that’s exactly the kind of thing I’m talking about. I’m not surprised a bestseller like him is good at it! Your point about splitting the disaster and reaction is golden! I’m going to go back through my manuscript tonight and see where I can work that in. Personally, I find this method much more fun to write too. It gives the reaction the perfect place to play out. While hammering my first draft out, I was keeping these splitting for editing phrase. But it will definitely be useful at that point. I used to ignore chapter breaks altogether when writing the first draft. These days, I find it easier to sow the hooks into the breaks organically. But there’s nothing wrong with the other approach. Hah! I do that too when I want to study something. I have a hard time *really* concentrating when reading on the computer. I never thought about this consciously but you make many a good point here, you always do. When I end a chapter, I make sure the point of that chapter is made but at the same time, allude that there are more exciting things to come. However, I don’t always recap the previous chapters when I begin the next because I normally start it with something fresh. Then there’s my last book where I start three chapters off with my protagonist having one of his fantasies of being a great ice hockey or baseball player. Recaps are always tricky. We need just enough grounding to keep readers up to speed with where the characters are after the break. But we never want to needlessly repeat information they only just read. You just saved my life K.M. This is very timely for me as I work on my first novel. I was really just winging it. I’m going back to read the old posts on structure and catch up. Glad to have you! 🙂 As you’ll discover, I’m a HUGE proponent of all things story structure. It’s a life saver in constructing strong stories and editing them to perfection. Good Stuff! Sometimes I write screenplays for contests and the matchcut is one of my favorite techniques. I have long been a fan of the scene structure I have learned from you here. Another technique I find valuable is what Shawn Coyne states, a plot can be advanced by revelation of information or character action. Revelations are *fabulous* hooks for chapter closings since they’re almost always game-changers. Readers want to read on and discover how the characters will react. To know where my story is going, I cut it up into – I hesitate to calle the scenes or sequels, since sometimes they’re both, or a series of them – let’s call them units of storytelling. I’ll give them titles and so far those have been my chapters (still editing 😉 ) Once I deliberately cut one of those in two while writing because I realized one character’s reaction to the scene made an irrestible chapter ending. But I realize I tend to write these units like mini-stories: setup (normal world, though I like to throw in some innocent-looking information that’s going to end up being important later on), action (or at least something happenening), reaction, return to normal (but usually with a question floating in the air.) I think it fits with the way my main character thinks – she’s a no-nonses sort of woman whose main goal is to keep her school running, so in way in makes sense that that should be what she always returns to. Thanks again for these useful tips! Betas know best. If they like what you’re doing and can’t put it down, that’s definitely a sign you’re on the right track. I love this blog/podcast. This is my new go-to move, after Writing Excuses. Great job! Thanks, Justin! Awesome to hear you’re enjoying the podcast. This advice arrived just in time for me. I just finished NaNoWriMo and am cautiously preparing for the revision process. Never had to revise such a long work before, so I am doing my research from those who know. Thanks for this wonderful information. I want to apply it where I can in my process. Glad it was useful to you! Keep your eyes peeled. Next month I’m going to be doing a Spreecast with Kami Garcia and James Scott Bell on the NaNo site about revision. There will also be a post here on the site. having a bit of trouble doing the chapter transitions in my current WIP. In it, I’m experimenting a bit with the time flow. There is an omniscient narrator that tells the story from the POV of various characters (including some secondary and tertiary characters), mostly of one different character in each new chapter. Sometimes, the narrator simply tells right away what other characters are thinking (and delights in the fact that the readers become aware of something that the POV-character doesn’t know, thus increasing the possibilities to torture that POV-character. I feel like an evil god while writing this story, and I enjoy it. ), but in most cases, the reader and the POV-character don’t know why the other characters react in one way or another. Most of my chapters end at those points where someone else does something unexpected that affects the plot. The idea is to make the readers go on reading the next chapter because they want to understand why. However, the next chapter may not explain that right away. Instead, it will mostly jump back decades and start telling a seemingly new story, often even starting with new characters. But the new story eventually blends into the present and explains the cliffhanger of the previous chapter (or of several previous chapters at once.) Why I’m doing it like that? Because it’s a novel in which I explore what motivates people to do what they do (commit crimes out of greed, necessity, need for revenge, love, etc), so the trigger often lies buried deep in the past. I was actually pretty proud of this work, because it’s like slowly intertwining many strands of hair (of various lengths) into one fancy plait. However, after reading this post, I fear readers might lose interest if the cliffhangers at the end of each chapter are not resolved immediately. What do you think? You’re right, this is a tricky question. I’m intrigued by what you’re attempting, and I think, if pulled off skillfully, it should work out very well. Most readers are patient when they understand there’s a grand plan and that you’re *not* just messing with them. When in doubt, of course, bring in the beta readers and see if it works for them. Very interesting advice. I like it.